"Many Species. One Planet. One Future." 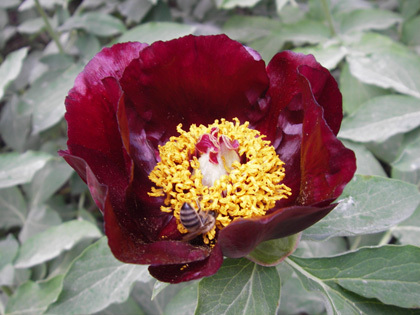 The Paeonia parnassica is a local wild deep maroon red flower, endemic of Parnassus, which was discovered in 1985, belonging to the genus of Peony known from antiquity for its medicinal use. Its habitat is doline karst slopes in forests of greek fir (Abies cephalonica). If you are lucky to get a glimpse of its fleeting bloom, do not cut it! The total population is found in two locations (about 1,000 plants) and is threatened by non-urban planning and attacked by nocturnal moths, not yet identified.